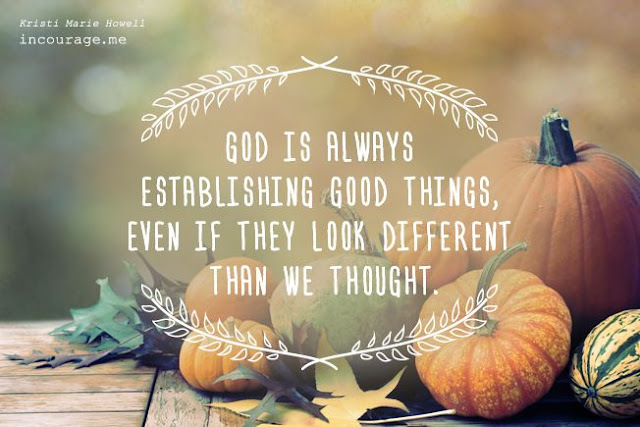 Reasonably Well: Happy Fall Y'all! Beautiful picture and graphics by Kristi Marie Howell at incourage.me. Hello, my friends. It seems that I always have abundant reasons for not posting as frequently as I have in the past, and I have another to the list. I have tremors that frequently are so severe that I can type on my laptop only by the two finger hunt and peck method. Oh brother. I thought previously it was related to my thyroid medication management, but the frustrating shakes are back with a vengeance. It has been a problem for a long time and I am guessing that the solution to the problem will be a long time coming as well. I have to say, in spite of shaking like a leaf, I do feel better overall than I have for awhile. I suspect that the fact that I have finally lost a significant amount of weight may factor in heavily towards my slow increase in energy and increased mobility. Can you tell that this cropped photo (sorry about taking out half your head, John honey) is from a church directory session? Like the Squiggy hairdo? 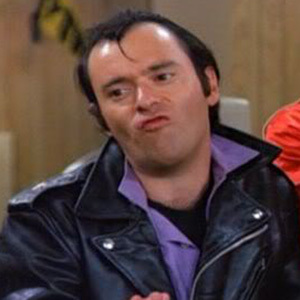 Oh, yeah Squiggy. (David Lander). You rocked that haircut, big guy. Me? Not so much. Image found here. So I really don't want to debate the merits of various diets and weight loss programs here, but I have to say that my internal medicine doctor and programs offered through the clinic were instrumental for my success. I guess all programs boil down to this: eat less and move more, and the easy part of weight loss is losing the weight. The hard part is keeping it off. So they say......but I can vouch for the accuracy of that. Y'all KNOW ME. My mango margarita obsession will be problematic here, as well as the upcoming pumpkin pie and fudge season creeping up on us. But I will soldier on and keep up the good fight, as I am sure that all of us have experienced in the war on obesity. (But, but.........pecan pie!...............) Begone, Bratty Inner Child Julia! BICJ has not been happy about the change in my eating habits. Too bad, so sad, girl. So there. So what's new with y'all? Share your happy and not so happy experiences this summer with me in the comments below. You look like a different person! Congratulations on your weight loss. I am confident you will be able to keep the pounds off. Best of Luck!! Hi Julia, you look great and I am so happy that you are feeling better. It is hard to maintain the new weight, sweet cravings never leave, especially around the holidays. Friday nights are my cheat night and I am good the rest of the week. I have a treadmill so I can walk every day even if the weather is bad.I also walk at the community centre with friends once a week on the indoor track. I was right, you did lose weight, it wasn't just my imagination, Congratulations, it's not easy to do, and harder still is to keep it off, but you can do it..you've already done the really hard work. Am I the only one who has a difficult time with body temp regulation? Summer seems to be worst as the heat truly bothers me, but I seem to be intolerant of cold air conditioning , especially for long periods of time. Also, the last few years, my allergies seem to have worsened, and I've noticed more stiffnes in hands and feet. Anyone else with problems in summer.? You look fantastic, Julia, and I'm so glad that you're feeling better, too! I am a bit concerned about the tremors, though. I don't think that weight loss should cause that. Have you seen a neurologist?